121 East Main Street Linden 931 589-2219 Open weekdays, 8 AM–4 PM VISITOR NOTE: Visitors are welcome but must pass through security screening. No weapons are allowed, and cell phones and cameras are not permitted while court is in session. Linden is actually the fourth seat of government for Perry County. When the county was organized in 1819, it included what is now Decatur County on the western side of the Tennessee. The first court met at the home of James Dixon on Lick Creek, then chose a site on the river for the county seat and named it “Perryville.” After the lands west of the river were ceded to Decatur County in 1846, the small settlement of Harrisburg, a few miles south of Linden, was made the new county seat. Two years later, county residents voted to move the county government to Linden. The first courthouse in Linden was a temporary log structure; it was soon replaced by a two-story frame courthouse completed in 1850. 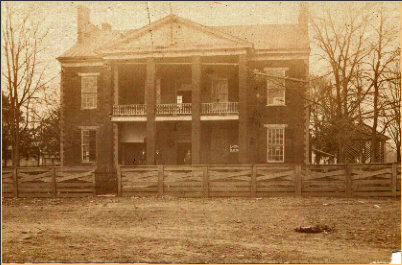 During the Civil War, on May 12, 1863, Linden was attacked by Union forces in an amphibious assault from the Tennessee River and the courthouse and all the county records were burned. No replacement was built until after the war when in 1868 county officials spent $9500 to construct a new brick courthouse. By the late 1920s, the 1868 brick courthouse was too small to meet local needs, so in 1927 the Perry County Court voted to renovate and expand the structure. However, while work was underway the following year, it too burned. The Court then determined to construct a much larger structure to meet the governmental needs; they wanted it to be stylish as well in order to showcase that Perry was a progressive county. They engaged Nashville architect Clarence Kelley Colley to design the structure; Bell Brothers & Company of Nashville was the contractor. The edifice is a good example of the twentieth century Colonial Revival style incorporating recessed columns and pilasters and Palladian pediments over the north and south entries. The striking courthouse continues to serve as the seat of government and was listed in the National Register of Historic Places in 1995. Perry County’s fourth courthouse in Linden is an emphatic example of Colonial Revival architecture reflecting the county’s progressive character. The Perry County Courthouse is a designated site on the Tennessee Civil War Trails system.